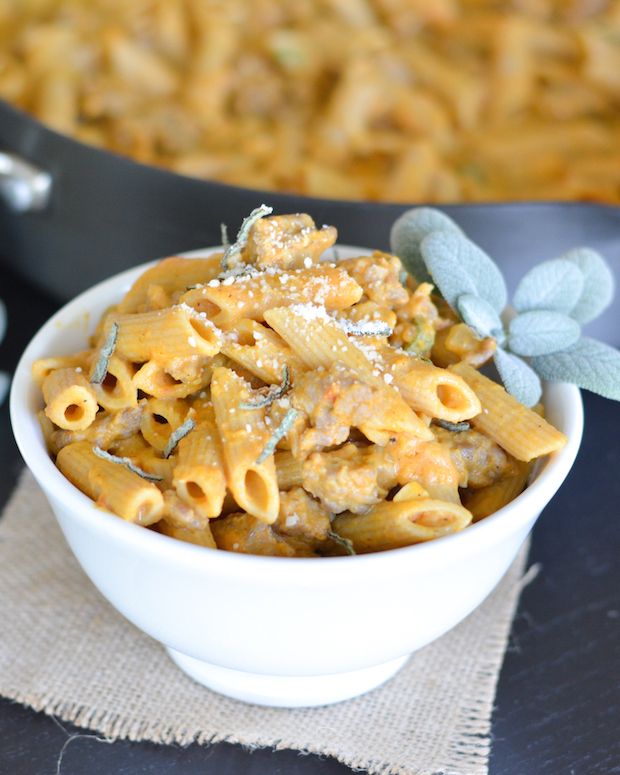 This Pumpkin Penne with Sausage and Sage is creamy, delicious, and ready in just 30 minutes! It’s a perfect fall meal for busy weeknights! Happy Anniversary to my wonderful hubby! It was actually yesterday, but since I didn’t post, I’m saying it today! 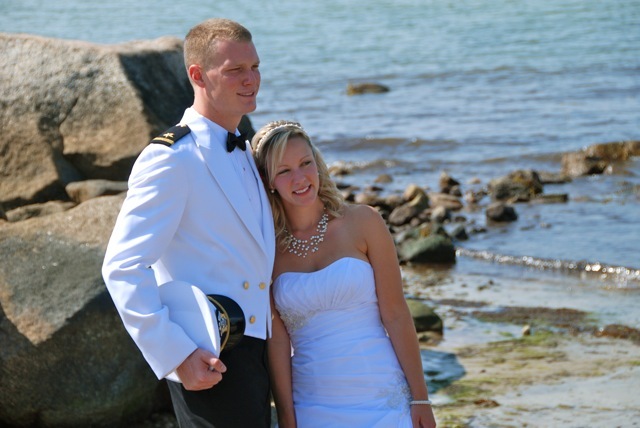 It’s been three years since our perfect Cape Cod wedding, and what a fast three years it’s been. We celebrated last night with a nice dinner out, at a new-to-us place that showered us with free apps, champagne and dessert! Champagne and dessert are the way to my heart. It’s a new favorite. Nick and I met almost six years ago, and back then I had about three things that I cooked. That’s not entirely true– I was good at following recipes and would make something new about once a month or so. But I definitely got stuck in ruts of making the same things over and over. Lots of pasta with jarred sauce and chicken breast. Buffalo chicken salads. In fact, I’m pretty sure those were the only two things I ever made in my college kitchens. About a week or so after Nick and I met, I wanted to impress him, so I invited him and his buddy over for dinner. And I made this pasta. Not exactly the same one, but it was a similar pumpkin pasta. They both scarfed it down. Years later, Nick’s friend told me that pumpkin is one of the three foods he hates… but he ate it to be nice! That’s true friendship. Nick does like pumpkin though, and somehow I haven’t made a pumpkin pasta (with the exception of this lasagna) since then. So being that fall is just around the corner, it was time. The best part about this recipe is how quick and easy it is to put together. The longest part is boiling the pasta, and that can be done while you’re working on the sauce. It’s perfect for a busy weeknight. Especially on a Thursday after a hectic week! While the pasta is cooking: Heat olive oil in a large saute pan over medium-high heat. Add onions and cook until beginning to soften, about 3 minutes. Add garlic and red pepper flakes and cook and additional 2 minutes. Add the sausage and break it up, cooking and stirring until cooked through, about 5-6 minutes. Add the chicken stock, pumpkin, cream, nutmeg and cinnamon. Stir and bring to a boil, then reduce heat and simmer for about 8 minutes. Season to taste with salt & pepper. Remove from heat and stir in sage, Parmesan and cooked penne. Serve topped with extra Parmesan! Some of my blog friends and I decided to start 30-Minute Thursdays. The first Thursday of every month, we’ll bring you some quick and delicious 30-Minute Meals. And September is the perfect time to start, since quick meals are especially useful with back-to-school craziness. Check out these other amazing 30-Minute Meals from some of my favorite talented food bloggers! And be sure to check back next month for more 30-minute goodness. What are your favorite quick and easy meals? I’m always looking for new ones, so let me know! Happy anniversary, Jess! Sounds like you had a great celebration! I’m loving this pumpkin penne! What a great 30 minute meal to kick off September with! Sounds perfect with the sausage, too! Aww happy, happy anniversary, Jess! I hope you guys went out and did something fun! 😉 And this pasta! Umm anything smothered with pumpkin is just a winner in my book, so suffice to say that this penne has just gotta happen. Like asaaap. Yum! I need more 30 min meals. Somehow mine always take longer than I think and dinner time often becomes the time the babe goes from sweet to beast-mode I really need to speed it up! I think I made pumpkin pasta for you guys for girls night one time too! 😉 This is a really yummy one! Happy Anniversary! I love pumpkin, but I’ve never actually made pumpkin pasta. I will have to change that this fall! This looks fantastic! Pinned! Aaaw happy happy anniversary Jess! And so nice of Nick’s friend to do that! 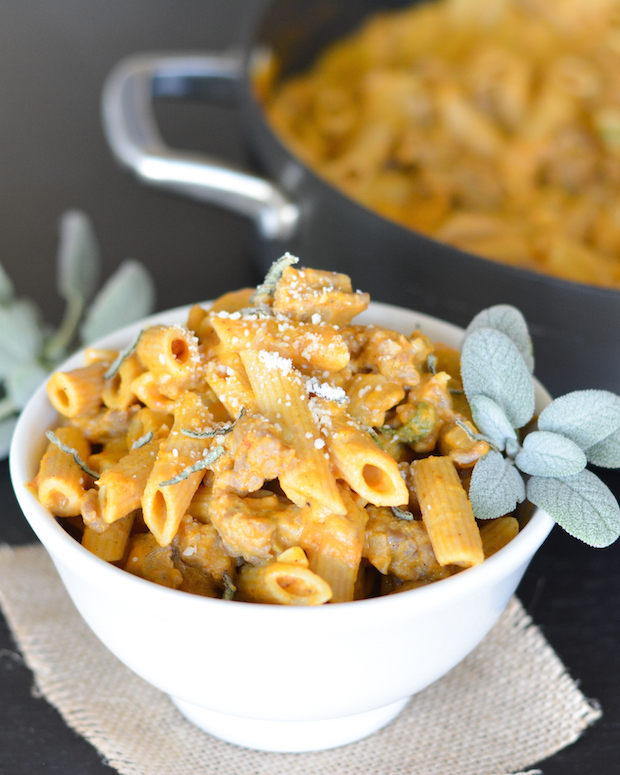 Love this pumpkin penne! It looks so flavorful and delicious! Aw happy 3 years to you both! It sounds like you had a perfect evening. Champagne and dessert are the way to my heart too lol Love the wedding pic! You were such a gorgeous bride!! Pumpkin in savory dishes is really so yummy. It’s an easy sub for butternut squash! Happy Anniversary! That is such a cute wedding picture, Jess. I love pumpkin, so adding it to pasta sounds perfect to me! I love that you added sage too, such a fun idea. Happy anniversary!!!! Congrats on three years :). This pasta looks perfect, and I love how fall-y it is. I am so excited for fall to officially be here! Pinned :). Happy Anniversary! Pumpkin is my absolute favorite flavor. I cook with it all year long. I just don’t admit it on the internet! 🙂 This pasta sounds fantastic and I love the 30 minute meal collaboration! I need fast and easy in my life! Happy Anniversary!! Woo hoo! You two are so cute. That picture at the beach makes me happy. As does these carbolicious bowl of pasta! Aww happy anniversary! The first meal I ever cooked for Ben was packaged Pad Thai, and then I found out his step-mom is not only Thai but used to own a restaurant….d’oh! This pasta looks so delicious, love all of those fall flavors you have in there. Yay for fall produce! Happy anniversary, you guys! I am craving this pasta big time and it’s just about time for bed for me. Haha! It looks so creamy and I love that it uses pumpkin! Happy Anniversary 🙂 Sounds like you had a great night out! This pasta is calling my name. 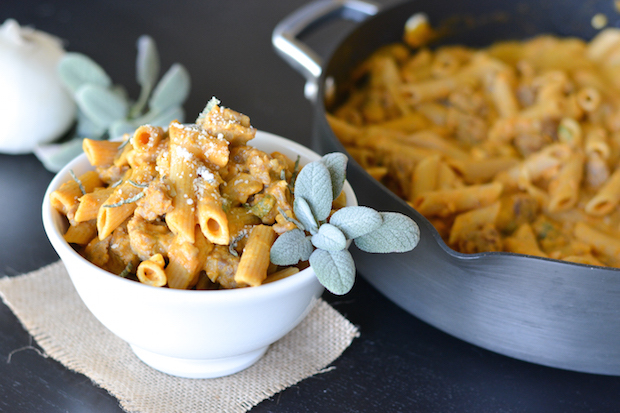 I’ve never tried pumpkin and pasta before but with fall around the corner I’ll have to try! Happy Anniversary!!! This pumpkin pasta looks like total comfort food. I love how creamy the sauce looks! Oh, this looks awesome! I love the sausage/pumpkin combo, and 30 minute meals are the best. Happy Anniversary! Aw I love your wedding picture! I am such a major sucker for wedding photos- especially a military wedding! And this pasta looks divine! I bet that pumpkin makes it so super creamy and delicious!